Have you ever fallen into the trap of buying only something that's perfectly finished, flawlessly decorated, even when the thing you bought was not of necessary use for you at the time? Well, I have to admit, I did. And I think home decor magazines (and not only them) are the perfect bait for such a trap, with all of those pictures lurking you into having "a dream life", a life of luxury even you can now afford... But if you can get a glimpse beyond that "dream life", you realize what you see is often overrated, and in the end the price you have to pay for such a life is... life itself. What happened with home-made items, no matter how clumsy they're made? What happened with reusing and reshaping old things we don't use anymore? When did we decide effortless is the way for progress, and when are we going to stop lying to ourselves that just because we got that thing into our home in less than 30 minutes, that makes is cheap and affordable? Well... these are just a few thoughts I have in my mind in the last few days. And because of that, when I shortly visited my favourite fabric shop - it's quite small, but very cosy and the owners are two very nice young ladies - I decided to buy a piece of printed fabric, very cheap just because during printing process, areas of spread paint appeared here and there. I didn't have something specific in my mind for it, but I particulary liked the floral pattern, of a dark, indigo blue shade. Later on, I thought: why not pillow cases? The fabric is sturdy, not very soft, so they should get quite nice. 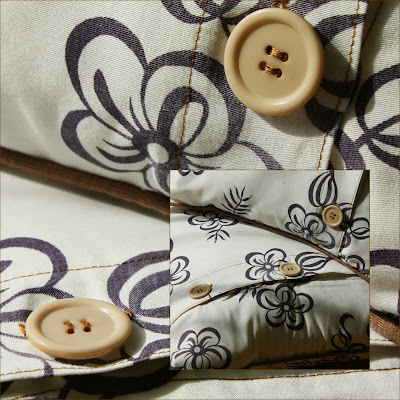 I also wanted them with piping edges, so I used in addition for each pillow case: four pieces of white cotton rope, four strips from an old T-shirt and three buttons from an old cardigan..
And the result? 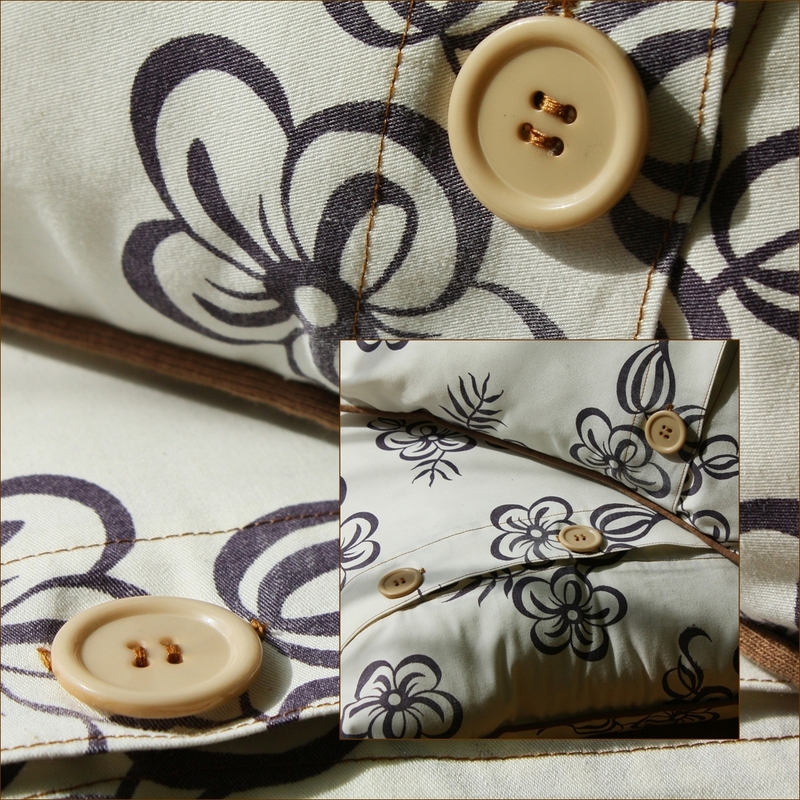 Two cheap 40 x 40 cm pillow cases, with floral pattern and buttons enclosure. Vi s-a intamplat vreodata sa picati in capcana de a cumpara un lucru doar daca era perfect finisat si impecabil decorat, chiar daca acel lucru nu va era si neaparat necesar la momentul respectiv? Eu, trebuie sa recunosc, am facut-o. Si cred ca toate revistele de tip “home decor” (dar nu numai) reprezinta momeala perfecta pentru o astfel de capcana, cu toate acele ilustratii ce ne ademenesc catre “o viata de vis”, o viata de lux pe care pana si tu ti-o poti permite acum… Dar daca putem zari macar o clipa in spatele acelei “vieti de vis”, ne putem da seama ca de multe ori produsele sunt supraevaluate si ca, in final, pretul pe care trebuie sa-l platim pentru o astfel de viata este… viata insasi. Ce s-a intamplat, oare, cu lucrurile facute de noi, indiferent cat de stangace ar fi fost ele? Ce s-a intamplat, oare, cu refolosirea si remodelarea lucrurilor vechi din casa, care nu ne mai sunt de nici un folos? Cand am hotarat ca lipsa efortului reprezinta calea spre progres si cand vom inceta a ne mai minti ca doar pentru ca am obtinut un lucru in mai putin de 30 de minute, aducandu-l acasa, asta il face si ieftin si accesibil? In fine… astea sunt cateva din gandurile pe care le am in ultimele zile… Si din acest motiv, intr-o scurta vizita prin magazinul meu preferat de tesaturi – un magazine mic, dar foarte primitor, in proprietatea a doua tinere doamne foarte dragute – am hotarat sa cumpar o bucata de material imprimat, foarte ieftin doar pentru ca in urma imprimarii, vopseaua se intinsese pe alocuri. Nu l-am luat pentru ceva anume, insa mi-a placut mult motivul floral, intr-o nuanta inchisa de albastru-indigo. Rezultatul? Doua fete de perna ieftine, de dimensiuni 40 x 40 cm, cu motiv floral si inchidere cu nasturi. Destul de simpatice, zic eu! SUPERBE !!!! Din astea vreau la casuta mea !!! Sunt atata de simple , dar atat de speciale , iar nastureii le dau un efect deosebit !!! Bravoo ! !